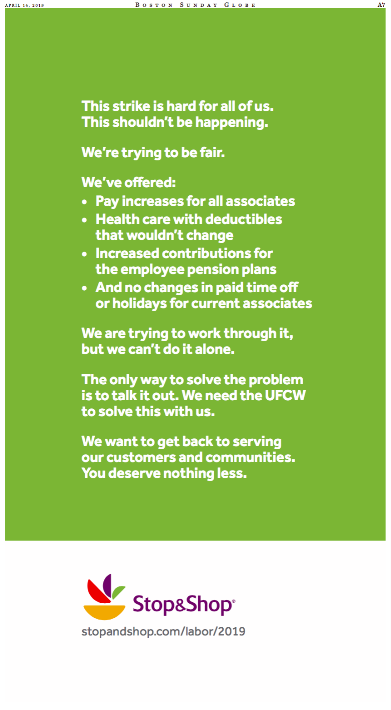 As the hardreading staff has previously noted, telecom giant Verizon has been wallpapering the Boston Globe (but not the Boston Herald) with this full-page ad questioning why union workers are striking over cuts in healthcare and pension benefits. Yesterday, Verizon doubled down with two ads in the $tately local broadsheet: The one above, and this one. And the response from the striking Communications Workers of America/International Brotherhood of Electrical Workers? Same today: Verizon two ads, workers none.